This post is part of my Business of Writing series. As part of this series, I discuss law and taxes, so it's important for you to remember that I'm neither a lawyer nor a tax professional. This is not advice -- it's my understanding and, in many cases, what I do and why. You should take this as the base to develop your own knowledge and understanding, or consult the appropriate professionals. Also, I live in the US, so am really only speaking to US law and the US tax code. Presale periods are a surprisingly divisive issue for authors, with some swearing by them and others … well, there’s some swearing involved there, as well. One of the arguments against them is that, at least on Amazon, sales from the prerelease period don’t “count” toward rank on release day, thus not driving a new release as high in the charts as it might otherwise go. I think that’s short-sighted. Marketing is all about eyeballs – getting more eyeballs on a product, repeatedly, so that it becomes more familiar and more likely to be purchased. Given this, it would seem that sustained, longer-term visibility is more beneficial than a shorter period, even if the shorter period gets more individual eyeballs. And that latter, that a higher rank for a shorter time gets more eyeballs than a lower rank for a longer time is debatable. I’d wager, were I a betting man, that its the opposite — that multiple months in a genres Hot New Release list is more valuable in terms of eyeballs than a week, or even a month, in Amazon’s top 100. A presale period does this by staying on the new release charts longer, exposing the book to eyeballs more often, and my personal dataset seems to bear this out. First by happenstance, then by design, I released three of my four books following the same pattern and at the same time of year. In addition, I do very little marketing, so my sales charts are largely unaffected by ads and are driven almost exclusively by visibility on Amazon. My first, third, and fourth books were all made available for prerelease in August, starting in 2014, with a release date in November, the maximum prerelease period available on Amazon to a self-published author. There were relatively few presales with the first book, but what I observed with the third and fourth was striking. Now, all of the expected YMMV caveats apply – this is data for a series, in the space opera genre, and may not apply elsewhere, especially to stand alone novels. Also, I’m tracking dollars-earned, not number of copies, because, frankly, that’s what I care about. I put my first book on presale in August 2014 for a November release. It had a trickle of presales over that time, and more sales when it finally released. Book 2 went on presale in November 2014 for a February release, which, I think, helped Book 1’s sales after a bit. After which, sales fell steadily through the new in the last 30-, 60-, and 90-day lists. Until Book 3 went on presale in August 2015. 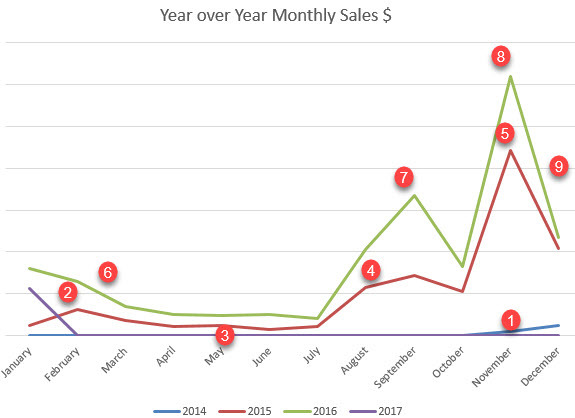 Now, it’s important to remember that the dollars for presales don’t register until the book’s actually released, so this jump in sales (of 10x the previous months) is entirely sales of the existing books, not the new one. I did virtually no advertising or promotion during this time, so the effect is entirely attributable to the visibility of Book 3 on the Hot New Release charts, which are significantly easier to get on than a category’s Best Seller chart. So I got 90-days of that visibility, then all the revenue from presales, and still had 30-days of “new release” status going into November. The question I started asking as Book 3 lost that status was: Is that repeatable? Not just the spike of new release sales and initial visibility, but the sustained sales of the previous books while the next is in prerelease? It seemed logical, but so many authors were swearing that the Day One spike was essential. Well, sure enough, it did repeat, with slightly different pattern because Book 4 went on prerelease a bit later in August this time. All of which resulted in, again, more presales of the next book, making November 2016 my best month ever. And projecting December to be better than last year as well, though not as much as it could be because the audiobook of the new release is a bit delayed (Book 3’s audiobook released in December 2015, increasing that month’s revenue. It could be argued that the higher rank of a Day One, no-prerelease spike might make more money, but given what I know about marketing, I don’t think so. Amazon’s algorithms favor stability of rank over spikes, so I don’t think a higher spike would last as long in its effect. I know that it would take a huge number of sales in 30-days of visibility from no prerelease to make up for the revenue I see in 120-days with one – it doesn’t seem feasible. Marketing is about eyeballs and while some people will buy your book the first time they see it, others will think “maybe” – the longer it’s visible, the more opportunities there are to both get the initial buyers and convert the “maybes” to yeses. I know I plan to repeat this with my next release and hope 2017 will be better still. As you plan your own prerelease, keep in mind that you can shorten it, but not lengthen it. So you can put your book up for a 90-day prerelease, then watch its sales and the sales of your other books. If it turns out that sales of your other books don’t go up, or go up and then fall, or your new book doesn’t make the Hot New Release chart for your genre and stay there, you can always bring the release date forward and have it release early. If yours does follow the above pattern, though, you can maximize its effect on visibility. Liked it? Take a second to support sutherland on Patreon! (c) Copyright Sutherland. All rights reserved.